The main reason why riots happen is due to the riots themselves. Once a riot and looting begins, they build up a momentum of their own. A form of herd effect takes place, people loot because others are doing so as well. A crowd offers anonymity so people who wouldn’t ordinarily steal feel that they can get away with it as everyone else is. It is hard to catch one thief when hundreds are stealing. Once rioting begins in one place word soon spreads other mimic them. If you could steal with little chance of being caught, many otherwise law abiding people would do it. What is interesting is that once a group of people decided to start rioting, there is little to stop them. This shows how heavily society is based on social norms, if these norms stop being respected by even a small group, society ceases to function effectively. If the anonymity of a crowd is the major reason why people riot, why does the riot begin in the first place? Why do so many people riot (an activity that has zero benefit) instead of looting (which has some benefit)? The standard answer is that they are mindless thugs who love to steal and destroy for its own sake. 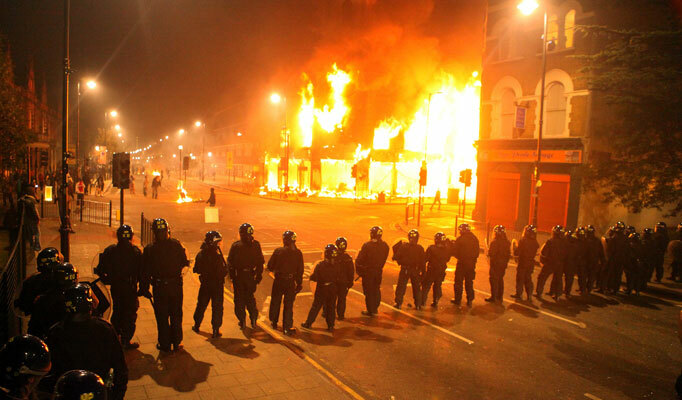 After the London Riots of 2011, words like “feral youth” and “criminal underclass” were used a lot. This approach is so simplistic that it rejects the idea of even considering why people riot, as though understanding was the same as sympathising. Instead they are criminals to be punished as severely as possible. Others use it as an excuse to blame their pet hates like the welfare state. Some view the riots as caused by an “entitlement culture” where people don’t work for goods but rather expect it to be handed to them. Or a dependency culture. Or the breakdown of the family (allegedly caused by the welfare state). These are comforting ideas to conservatives. It absolves them of all responsibility to change anything, they can stay as they are, it is the others that must change. There is nothing wrong with society; it is the criminals who are wrong. At its most extreme you can hear the sneering tone of ancient lords looking down their noses at peasants in the gutter. Yet this view is notable only for how little it illuminates. It gives no reason for rioting or why it is primarily poor youths who do so. It involves intellectual summersaults to claim that the most deprived sections of society have been spoilt by the welfare state. It requires gross ignorance to claim that the problem of the poor is that they have life too easy. It is more a case of what some want to be true rather than what actually is. But what if there is something deeper? What if the rioters have a reason for their action? I don’t mean this to excuse them or condone their actions, but rather it is true understanding their motivations that we can prevent future riots from happening. There must be a reason why riots always take place among inner city working class young men. Behind every action there is some motivating reason, some logical progression that makes sense to the perpetrator. By understanding what this is, we can ensure that London doesn’t burn again. People destroy out of frustration (the frustration-aggression hypothesis). When people find they cannot achieve their goals as something is blocking them, they become frustrated. Among young men this frustration is expressed through anger and violence and in extreme cases, rioting. When people feel that the world is screwing them over, they lash out at the world. Years of built up humiliations and failures form into resentment and alienation. This last point is crucial; alienation means people no longer feel attached society. They feel that society has done nothing for them so they no longer feel any responsibility towards other members of society. What causes these frustrations? There are numerous possible explanations but I believe poverty and inequality are the two major ones (which is why rioting occurs in the poorest part of unequal societies). Most people have similar goals in life, they want to be successful. In Western societies this usually is judged based on material goods and a good job. If people from poor backgrounds are unable to fulfil these goals they become frustrated. This is why unemployment and poverty are underlining motivations for riots. If success is judged on how much possessions you have, then a poor person can be considered a failure. This breeds resentment. If they feel that they fail not through their own efforts but because of factors beyond their control, then they begin to resent “society” for blocking their goals. Because it is unseen inanimate forces that they feel are holding them back, when this frustration does explode, it does so randomly. They take out their anger on random objects nearby (often those that are weaker than them) be it animals, women, buildings or other young frustrated men. Inequality plays a large part in this. If everyone is suffering then there is less resentment, however, if it is felt that some (even a small group) is parting while the rest toil, then resentment grows even more. Not only are young men unable to achieve their dreams but they feel mocked by the magazines full of successful people who have. Young people play close attention to the lives of the rich and famous and try to emulate them. When they find that these hopes cannot be fulfilled they become frustrated. In a society where the gap between the rich and poor is very wide, not only is the bar set higher to be considered successful, but it is far harder for the poor to advance. If people feel the deck is stacked against them, that through no fault of their own, the luck of birth has consigned them to poverty, resentment will build at the unfairness of it. This is why corporations in particular where targeted by rioters, they felt the corporations had plenty of money while they had little. Special attention should be given to the fact that rioters are almost always young men. This is because young people are more aspirational and hopeful about what they can achieve in life. It is when these hopes get blocked that they become bitter. Young people are less patient, less willing to wait years in the hope of improvement. They want the world to change today, not tomorrow. They are also not fully adjusted to the idea of not fulfilling their hopes. Unlike older people who may be more beaten down and accustomed to poverty, young people still want to fight against it. This is also why rioters are overwhelmingly male. For men, anger is the only socially acceptable emotion to publically display. If a man cried at losing his job, this is a sign of weakness, whereas if he got drunk and smashed something, this would be more understandable (particularly in traditional societies). Men are raised from a young age with the belief that physical methods are the best way to achieve your goals. It is regular to describe a job “hunt”, the “struggle” to get a job which men have to “fight” for. Unemployment and poverty are more humiliating for men as they are raised to be the bread winners, the strong provider who others rely on. Failing to get a job is failing to be a real man. By being unable to take part in society through working, men become alienated from it. They therefore see it as natural to express this alienation and frustration through violence. Most riots have a race element if only because they usually happen in urban areas which are the most multicultural of any country. Race links into the frustration and alienation that I spoke about above. If black people feel that society is run by white people for their exclusive benefit, they will feel excluded from it and therefore excluded from responsibilities to it. They may feel that it is the colour of their skin that is holding them back. Resentment over racism usually is the gunpowder behind the explosion of a riot. White people may riot against immigrants if they believe the immigrants are the reasons their goals are proving impossible to achieve. 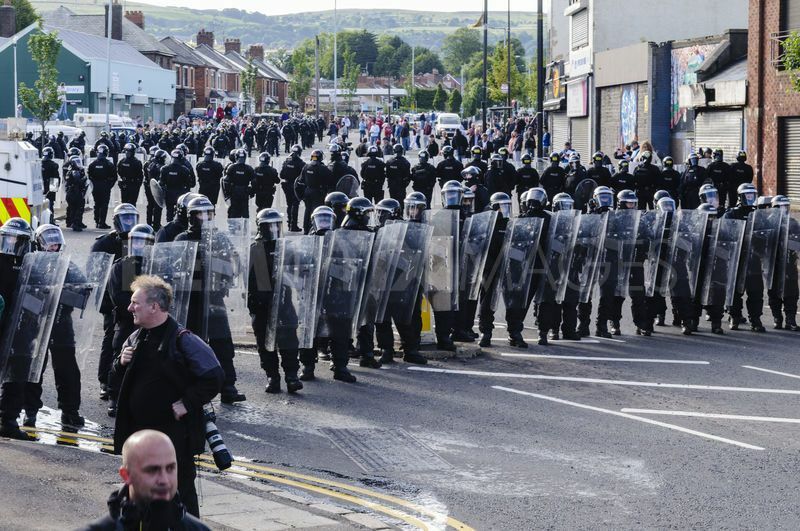 Riots may also be sparked by political events such as those in Northern Ireland or after the assaination of Martin Luther King. Again the underlying cause is frustration and alienation. Regardless of whether the motivations are race, class or politics, the motivations are the same, only the target changes. What is noticeable about riots is that almost all of them are provoked by an incident involving police. This is true of London 2011 as well as the riots in America in the late 60s. People riot against what they see as police brutality. In poor areas many complain about what they consider as intimidation and harassment from the police. They feel they are unfairly targeted either based on their race or their age or just where they live. They consider constant police searches and interrogations as humiliating and making them feel weak (when faced with the force of the law we are all weak). This frustration eventually blows up with riots and attacks on the police, which some see as revenge. Riots are not simply explained by stereotypes of young criminals engaging in thoughtless destruction. If we continue to engage in these lazy sops that are little more than wishful thinking we will fail to understand the true cause of riots. If we do not address the underlining motivations, then we are doomed to watch them repeat themselves again and again. Until something is done to address the frustration and alienation that young men have towards society, then the threat that cities will burn will never go away. Excellent essay. I would hazard to say stampedes follow the same rules, or lack thereof. The capitalist consumerist scenario markets a perception of happiness that is purposefully unreachable. It’s a carrot of ownership, always just beyond reach, dangling on a string of debt from a stick of net worth, which is nailed to the head of every consumer at birth. Millions of people waste most of their time in pursuit of that unattainable extravagance of happiness and never give a moments thought to achieving contentment. When the rigged system denies access to the most meager success at achieving even the lowest levels of this material happiness, which indoctrination demands, frustration, resentment and rage are to be expected.